You’ve seen and passed over Bust-A-Move countless times. Today you could mistake it for any number of tile-matching puzzlers that pad out the iPhone App Store. But Bust-A-Move is far from shovelware. Three is the magic number in Bust-A-Move. 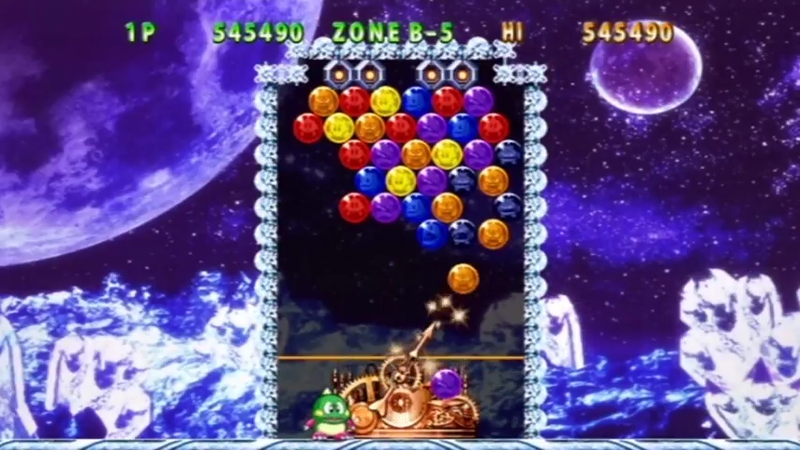 Bust-A-Move – or Puzzle Bobble as it was also known – evolved from Bubble Bobble, the classic 8-bit arcade game from Taito that featured a unique gameplay mechanic, with up to two players taking control of Bub and Bob, cheery little dragons who blow bubbles to trap and burst enemies. 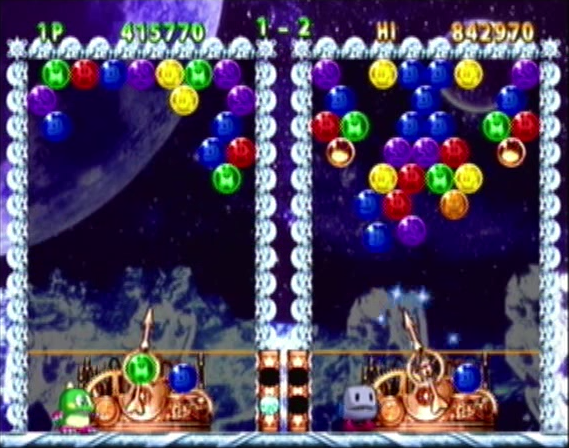 Bubble Bobble’s legacy can be found in sequels Rainbow Islands, Parasol Stars, and subsequent remakes. 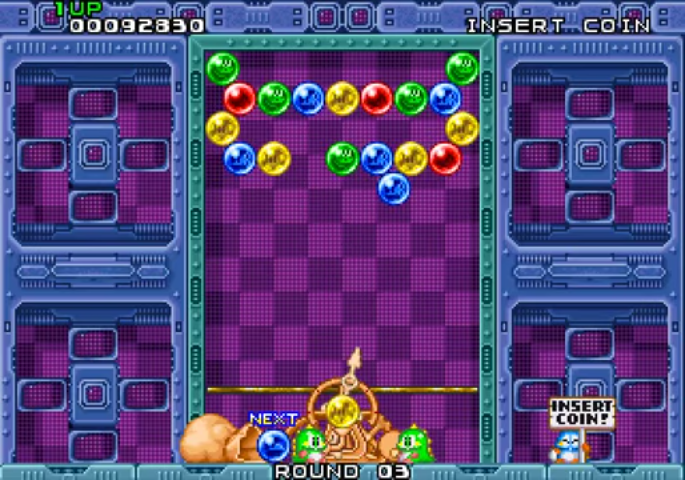 But Taito also spun the series off into arcade puzzle territory with Bust-A-Move, originally released in 1994. Like the grandfather of the genre, Tetris, this tile-matching game’s hook is simple – fire different colored bubbles into an arena to match-up three (or more) of the same color, popping the bubbles and clearing the level before the “ceiling” drops down on you. Simple then – and addictive. As with all great puzzles games, Bust-A-Move buries itself into your brain. The hook is in perfecting the placement of the bubbles – lining up your move, judging the angles, placing shots to burst those key bubbles that will blow out multiple other connected bubbles in one go. In one-player mode, Bust-A-Move showcases pure design brilliance – Taito expertly fused puzzles, arcade action, and tactical (and spatial) thinking. That tactical element can be seen in the two-player versus mode, where groups of bubbles cleared from your screen will result in troublesome bubbles being dumped on your opponent’s arena, wrecking their best-laid plans – and vice-versa. Like two-player Tetris, versus mode Bust-A-Move is furious, frenetic gameplay. Bub battles Benzo in Bust-A-Move Plus! I came back to Taito’s classic recently with Bust-A-Move Plus!, having reached the end of my Wii backlog. And frankly I’d forgotten I’d bought this on the Wii Shop Channel a couple of years ago. Bust-A-Move may be the game that you return to only when you’ve run through all your technically more sophisticated games, but it’s the game that grabs you and takes you right back to an era of unalloyed design. A simple concept beautifully realized, Bust-A-Move is an overlooked classic of bubbly genius. Very nice retrospective! I first played Bust-a-Move on N64 and had a great time with it. It’s a very underrated puzzle series that did it so differently even back in the day. I agree about the brilliance of its spatial arcade action. Very fun both in single and multiplayer! Thanks! And that was the version of Bust-A-Move that I had as well – I stumbled across the original arcade in the late ’90s, then got Bust-A-Move 3DX on the N64! Personally, the PSP version was the one that really hooked me. Makes a good handheld game. I remember always thinking this game was so novel back in the day. Where other puzzle games in the ’90s were mostly variants of Tetris featuring blocks falling from the sky, this game was quite different from that. Yes, there’s just something about the matching of the bubbles, the way they interconnect, that makes Bust-A-Move such a unique take on the tile-matching genre. I always loved these games. I remember Bust-a-Move 2 on the N64 rather fondly. Innit. Bubble Bobble was pretty awesome as well. Bubbles! I love Bust-A-Move! I played it at an arcade as a kid, but the game I played most was Bust-A-Move for the SNES. I think I made it to Level 99 but never cleared the final level, haha!